Former Portadown manager Ronnie McFall has been confirmed as a guest speaker for Glenavon’s forthcoming fund-raising event. 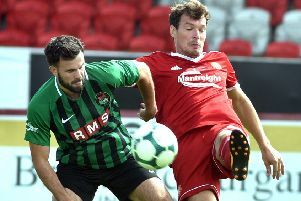 Last weekend marked the one-year anniversary of McFall’s departure from Portadown after almost three decades as manager of the Lurgan Blues’ derby rivals. Tickets are now on sale for the St Patrick’s Stew and Craic lunch in The Bedeck Sports Bar on Saturday, March 18. The fun is set to start at 12.30 and the admission fee of £20 will cover entry to Glenavon’s league game against Coleraine, with a £10 concession rate for season ticket holders. Anyone interesting in booking a spot can contact a club director or the office (9.30-12 o’clock daily) before Friday, March 17 to obtain a ticket.